As 2017 drew to a close it seemed like we were being inundated with messages. Everything from The Best Top 10 Lists to 17 Tweets That Sum Up 2017. The final days of 2017 felt somewhat familiar…like the final days of the school year. The excitement gradually building up before Christmas Holidays. Being educators, we try to recharge over the holidays. It is blessing that we get to have some quiet reflection time before we head into the second half of the school year. I wonder how these same students will view 2018? Will 2018 feel like a new beginning for them or will they follow a similar script from 2017? As a leader, I want to be that someone who helps to change the script for these students. I want to be part of that new script. A positive script; a script of new beginnings. 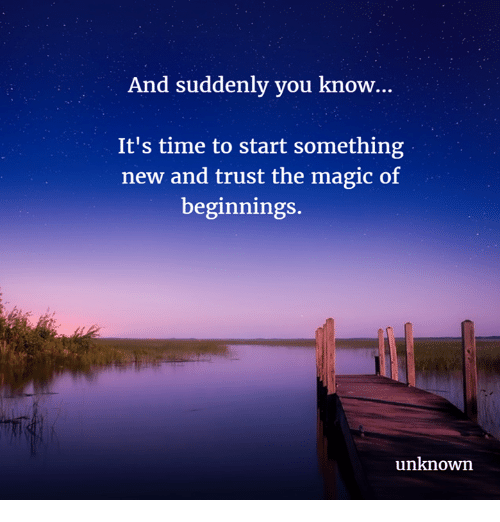 I wish for all students to trust the magic of beginnings. I have been thinking about my #oneword for 2018 and it has proven to be a challenging task. Through this process I have gone back and forth with what I think my word will be and why. I have had many conversations in my head about this. I have reflected on last year’s word and I was happy with it. The word was believe. It was and continues to be a word that instills in me, hope. The word believe keeps the kindness message at the forefront of everything I do because kindness is what I live and model for my school community daily. I wish you all a Happy New Year and encourage you to reflect upon the ‘magic of beginnings’ as you make your way through 2018! Beginnings is a great word- so full of possibilities! And possibility is my word for 2018. Cheers to a great year! I love your word possibility because new years are always full of possibility and that, to me, is what working with students, teachers and families is all about…possibility! Happy New Year to you!